lily wrote: You know, since they have come back on the scene, don't you realize how much you missed laughing at them? I have gone beyond laughing. I am mostly strangulated these days. MADELEINE McCann’s parents have vowed to report “malicious and offensive” trolls to cops as the torrent of online abuse rises in the run up to the tenth anniversary of her disappearance. Kate and Gerry McCann fear they will be subjected to an even bigger outpouring of internet hate as the heart-wrenching milestone approaches in May. Last Sunday selfie queen Karen Danczuk sparked fury by claiming the couple “have guilt” in an astonishing Twitter tirade on Kate’s 49th birthday. She said: “Anyone who says McCanns are innocent, just remember they left 3 children under the age of 4 alone to go out. Either Way they have guilt! KD”. Former glamour model Jodie Marsh recently launched a similar attack, slamming the McCanns while apparently watching investigative journalist Mark Williams-Thomas revealing his latest theory on the case on ITV’s This Morning. A close pal of the McCanns said of the approaching anniversary: “It’s a very difficult and emotional time for them and they don’t need the extra anguish of having tweeters and minor celebrities posting negative and hurtful remarks about them. “They are now filtering, with the aid of their official representative and friends, any cruel and offensive material which oversteps the mark to pass on to police to assess. Malicious communication is an offence. “People seem to be saying whatever they want which is the eyes of the law could be deemed a criminal offence. There is a constant and growing activity by these ghouls and it’s a disgrace. The McCanns, from Rothley, Leics, are targeted by up to 150 abuse tweets every day, most of them sent by women, research found. The couple’s spokesman Clarence Mitchell told The Sun Online: “Any threatening and malicious communication will immediately be forwarded to the police for them to investigate and to act upon where necessary." Mr Mitchell has also been bombarded with abuse himself for representing the family. Kate revealed that while she and heart doctor husband Gerry, 48, try to ignore the negative comments posted on Twitter and chat forums, some are too malicious to forget. Gerry has in the past hit out at trolls targeting his family with threats of violence and kidnapping, and said he worries about his 12-year-old twins Sean and Amelie using the internet. He told BBC Radio 4’s Today programme: “There have been instances where people are threatening to kidnap our children. People are threatening violence against Kate and myself. Kate and Gerry also hit out at the “insensitive” way Madeleine was drawn into hit BBC drama The Moorside – based on the fake kidnap of Shannon Matthews. Three-year-old Madeleine vanished from a holiday apartment in Praia da Luz, Portugal, on May 3, 2007, while her parents were dining nearby with pals. British police are winding down their £13million probe, but Kate and Gerry have never given up hope of finding their daughter, who would now be 13. The hate squad have been emboldened by Amoral's dubious 'victory', IMO, and are also following in his lead. The hate and filth they spew about the McCanns and others, on social media, is utterly vile - they'd be up in court charged with hate crimes if they targeted anyone else like that. And their grotesque photoshopping is a terrifying insight into what goes on in whatever passes for their minds. I wonder if they realise that the authority of Portuguese courts ends at the Portuguese borders, thankfully. Please note that CMOMM is completely opposed to personal attack, we can only support consideration of the evidence available, and informed comment. Ha! Someone watching them, are they? It beggars belief that they see nothing wrong with the disgusting 'theories' they invent about people, or the way they Research aka Googlestalk anyone that is connected, even in the most tenuous manner, with the McCanns. Or Clarence Mitchell. Or any other name they pull out of their grubby hats. It passed well beyond mere discussion long ago, IMO. No surprise that the hatertrolls are all still spreading lies - I thought Zuckerberg was clamping down on Fake News? 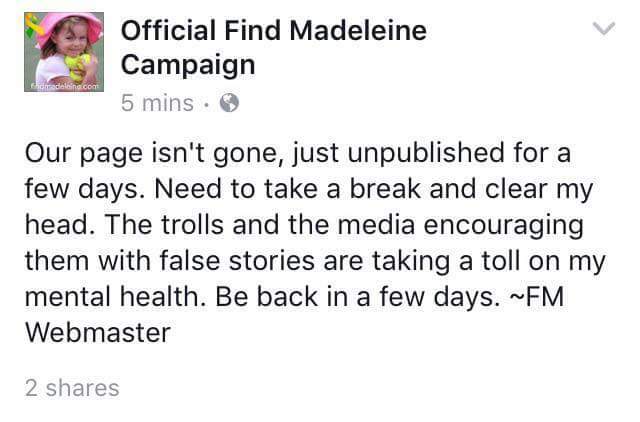 THE official Find Madeleine Campaign Facebook page has been taken off line after being inundated with trolls. In a distressing post shared to its followers, the administrator of the page wrote they needed to “take a break” from the online world, with trolls and false stories “taking a toll” in the search for Madeleine McCann. The official Find Madeleine Campaign is endorsed by Kate and heart doctor husband Gerry McCann. All posts by the site’s un-named web chief, a mum who runs the site with a group of fellow supporters, are approved by the couple. But the distressed webmaster appears to have posted a message on the page before pulling it down, writing: “Our page isn’t gone, just unpublished for a few days. It is not clear if there was a specific incident that sparked the Facebook page to be pulled. It is not the first time that the Facebook page has had to be pulled down, with the Sun Online revealing that it was temporarily closed down after a surge of false “leads” flooded the website three months ago. At the time the Webmaster posted: “Some of you may have noticed our page not being available these past few days. Due to an increase of fabricated so called ‘leads’, I’ve been turning the page off to keep people from posting/spreading false information. A McCann source said: “It’s upsetting and distressing for Kate and Gerry and they have advised the website organisers to be vigilant and act if anything inappropriate is posted.”....more at link. The Gonzo-worshippers on the sewer they have made of #mccann were opening boasting about trolling and posting abuse on Madeleine's FB page, seemingly unaware that ANYONE can read twitter, account or no account. Still, what else can you expect of bottom-feeders that idolise convicted perjurers, convicted torturers, and animal abusers? The official #mccann fb page is shutting down cuz numbers all falling fast,it's not a find m page it's an arse licking dare to ask Q's page! Please note how the Gonzo fan club describes a support site for a missing child - and then they cry and whine because they're called HATER TROLLS. Sounds like a threat to step up the trolling and abuse - let's hope the Sun is watching. In a post, the administrator of the "Official Find Madeleine Campaign" page said they needed to "take a break" and "clear" their head. They wrote: "The trolls and the media encouraging them with false stories are taking a toll on my mental health. Be back in a few days." The page, endorsed by the McCanns and followed by hundreds of thousands of people, has since gone back online. However, the administrator warned that it will keep being unpublished if trolls continue to post such messages...etc. Sickeningly, the Amoral-supporting trolls regard tormenting this woman as a 'victory'. You are wrong, sweetcheeks, completely and utterly. That's the price you pay for getting into rotten company and believing their lies. PS - Ms March is involved with an anti-bullying charity. As she is also involved with some of the most vicious trolls on the internet, she really should resign, as it is sheer hypocrisy for her to carry on, IMO. ‘The witch hunt against them is disgraceful. After all, how sick in the head do you have to be to post frequently-obscene abuse on a support site for a missing child? And then publicly boast about it? Haters announce their intention to attack Madeleine's FB page AGAIN.